I was listening to the cricket today and one of the guest English commentators enquired as to the process in picking which team to support in the AFL. His question was probably aimed more at Melbourne, the epicentre of the game, but the question itself is valid no matter where you are from. It isn’t an easy answer, either. Firstly, the question has answers that fit for grass roots connections right through to national and international clubs. There are so many ways a person can become attached to a club. Whether it be geography, traditions, family, success, colours, personal connection, sporting idol or just throwing a dart at a dart board, people always have a story to tell. Most of those conversations will revolve around the VFA/VFL/AFL lineage, and interstate competitions such as the WAFL, SANFL NTFL and more, but the connections to a club are still vast. In my own case it was easy. Dad was a Bomber fan, therefore I inherited that love. Mind you, that was in competition with a Geelong mum, Collingwood grandfather, quietly Richmond grandmother and peer groups that set out to influence everything from your clothing, taste in music, favourite places to hang out and which team you should support. Nevertheless, I survived all of that and made my dad proud. Dad was aided and abetted by one of my aunties who was also a staunch Essendon supporter, and had some hand-made metal bombers, circa-1940’s, which had been kiln painted in red and black. They were truly the coolest things I’d seen and made a visit to my aunty and uncles house very worthwhile. Each year, when a team wins a flag, a new legion of fans is born. Mostly they are younger people just entering the world of supporting a club and heavily influenced by the success of that year’s premiers – provided family or some other influence doesn’t get a foothold. The change from the old VFL to AFL had some big supporter changes. Western Australians and Queenslanders (as well as New South Welshmen in 1982) went from supporting their local state league club and possibly supporting a VFL club also to having their own teams in the state (Sydney Swans in 1982, West Coast Eagles and Brisbane Bears in 1987). As time passed, the Adelaide Crows joined in as did Fremantle Dockers, Port Adelaide Power and more recently the Gold Coast Suns and Greater Western Sydney Giants. It has meant that supporters in four states have two teams each to choose from. Yet, I know my cousins in Adelaide were devout Glenelg and Carlton supporters and still are. I guess that privately they probably do follow one of the South Australian AFL clubs, but I never hear it. Colours are also a funny thing. My first playing colours were Collingwood’s black and white stripes. This is more accurate than just similar…my club, Clayton, were donated old Collingwood jumpers (complete with matching moths, which had eaten the jumpers in places, leading to the club’s localised nickname – the ‘Holes”). Yet that wasn’t enough to sway me from Essendon. However, it was red and black which led me to follow West Adelaide in the SANFL and more recently the Tiwi Bombers in the NTFL. Yet, there are some kids I played at Clayton with who did go on and follow the Magpies because of the colour connection. Proximity certainly has an impact. To be close to the headquarters of one of the VFL teams, especially if you fell within their local player catchment, would see a certain tribalism. Many will argue and counter-argue, but Collingwood, Richmond and South Melbourne were three clubs that showed this connection well, as did Carlton and Fitzroy. Essendon did also, but was a fraction further out in the ‘suburbs’ and Geelong had an entire city and surrounding districts that drove the club's support. That connection can now be better seen with the interstate clubs, but still exists in a localised form – just not as noticeably as before. 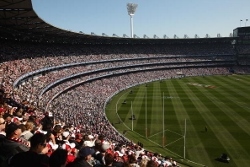 But a wander through the suburbs of Richmond and Footscray over the past two years would open your eyes to just how connected those suburbs are to their premiership winning clubs. One of my earliest, and joyous, memories of a visit to Windy Hill (Essendon's home ground in the old 'tribal' days) was to walk from the railway station to the ground along Napier Street and see all of the businesses with player photos or other red and black adornments in the windows. I had entered the "Essendon" zone. Many people have personal connections to clubs – either players, officials or someone else connected to the club. But past greats are a huge drawcard. At Essendon, people would support the Bombers purely on their love of John Coleman. The same happened for “Captain Blood” Jack Dyer at Richmond, any of the Coventry’s at Collingwood and more. Some players transcended the club and would be universally loved. It still happens today. I know of a kid who supported St Kilda purely because of his love for Nick Reiwoldt. There are so many ways club connections are made – and the same happens at all levels of the game. But as 2017 draws to a close, maybe you could look back and remember the reasons for your reasons for becoming a part of a footy tribe.